Bavaria is the southeast region of Germany, the land of fairytale castles, Oktoberfest, and lederhosen. With the Alps to the south and idyllic towns dotting its hillsides, Bavaria is a beautiful and romantic destination. 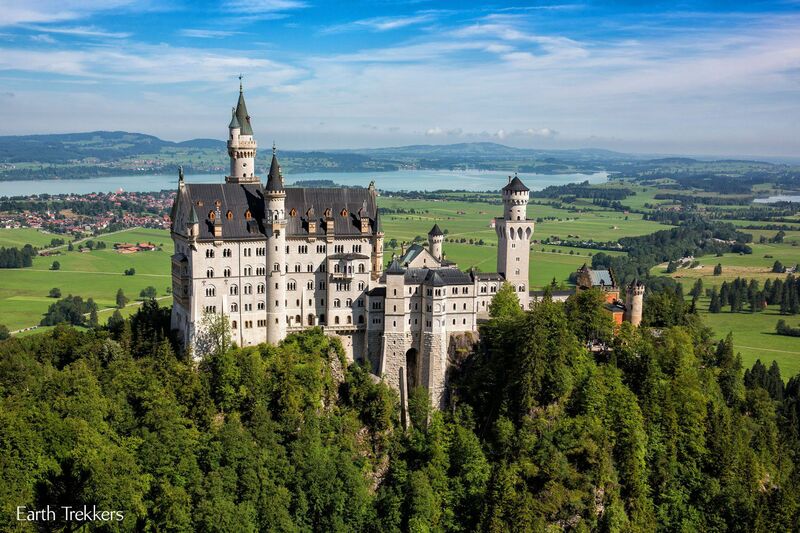 View the Alps from Germany’s highest peak at Zugspitze, tour crazy King Ludwig II’s storybook castle Neuschwanstein, learn about WWII history in Munich and Berchtesgaden, and even take day trips into Austria. 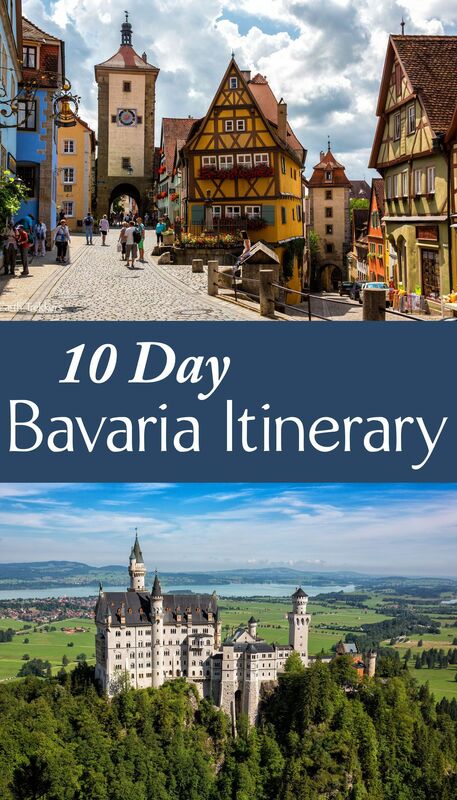 Bavaria is one of our favorite spots in the world and you will see why on this fast but very enjoyable Bavaria itinerary. How to Use This Map: Click the tab in the top left hand corner of the map to view the layers (Where to Go and With More Time). You can click the check marks to hide or show layers. If you click the icons on the map, you can get more information about each point of interest. Arrive in Munich in the morning. Pick up your rental car and drive southeast to Berchtesgaden. It is a two hour drive (150 km). Spend the afternoon visiting the town of Berchtesgaden. Want to try giant, German cream puffs? Visit Windbeutel Baron for over-the-top desserts and awesome views over Berchtesgaden. The two main sites in Berchtesgaden are Lake Konigsee and the Eagle’s Nest. If you are traveling with children or want to take a tour of the underground salt mines, Salzbergwerk is another option for today’s activities. Lake Konigsee is Germany’s highest lake. It is a beautiful lake framed by towering, green mountains. Tour boats run frequently, taking visitors around the lake. There are plenty of restaurants down by the water’s edge for great lunch and dinner options. 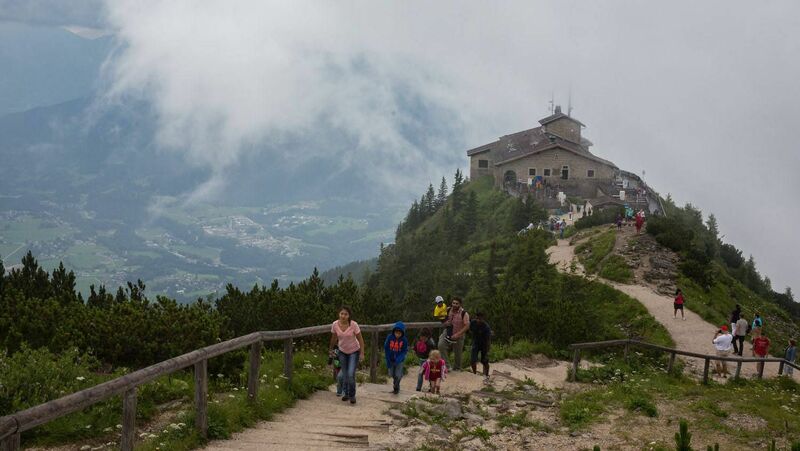 Hikers may prefer to hit one of the trails in Berchtesgaden but this will not leave much time in the day to get to the Eagle’s Nest. The Eagle’s Nest, Hitler’s command post during WWII, cannot be missed, even by those who are not history buffs. Start at Dokumentation Obersalzberg, a museum that gives an overview of Hitler’s life, vision, and eventual outcome. Most of the exhibits are in German although there are some English translations. Buses run from the Dokumentation Center up to the Eagle’s Nest. These buses are the only way to get to the Eagle’s Nest; you are not permitted to drive if you have a car. The Eagle’s Nest was Hitler’s command post during WWII. This historical building is now used as a restaurant. 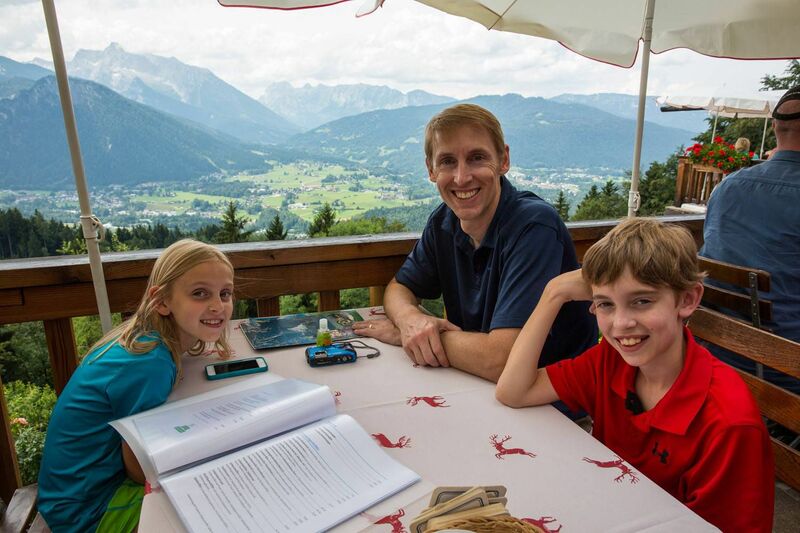 The best part of visiting the Eagle’s Nest is getting a bird’s eye view over Germany and Austria. It is best to visit the Eagle’s Nest when the skies are clear. Salzbergwerk is a 90 minute tour through the underground salt mines. Don special jumpsuits, ride on an underground train, and slide down wooden chutes. It’s a great activity for kids…fun and educational. End your day with dinner in Berchtesgaden. Salzburg, Austria lies just over the border from Berchtesgaden. It takes just 35 minutes by car. Spend the day touring Salzburg, visiting the Salzburg Fortress, Mozart’s birthplace, the Old Town, and Schloss Mirabell. You can even take a “Sound of Music” tour. After breakfast at your hotel or guesthouse, drive west to Garmisch-Partenkirchen. It takes two and a half hours (200km), arriving in Garmisch around lunchtime. Spend the afternoon checking into your hotel and exploring the main part of town. Have dinner here. Or, if you are traveling with children, consider visiting the Olympic Village, where you can ride chairlifts up the mountain and stand on top of the ski jump. Our kids loved the toboggan ride. Garmisch-Partenkirchen is going to be your home base for the next three days, until you head north along the Romantic Road. This is best done on a clear day. You want to be able to get the best views over the Alps. 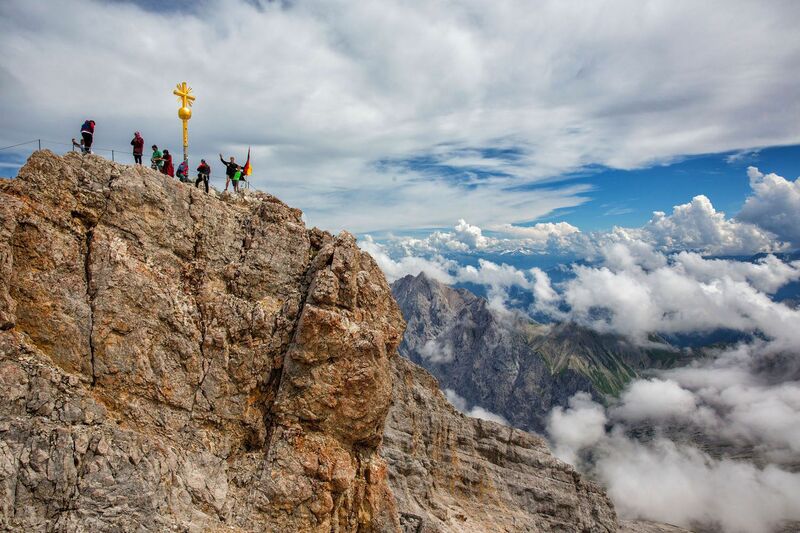 There are several ways to get to the summit of Zugspitze…by hiking or by cable car. Most people choose to ascend Zugspitze by cable car. Note, that if you plan to hike up to the summit of Zugspitze, it is a two day journey. We wrote a detailed post about how to visit Zugspitze that you may be interested in reading. This castle is one of Germany’s most photographed icons. Thousands of visitors flock here everyday to see this fairytale castle. Neuschwanstein can get quite crowded, especially during peak season. But don’t worry, there is a way to avoid these huge crowds of people. The trick to having the best experience at Neuschwanstein is to arrive early. When I say early I mean at least a half hour before opening time, especially during the summer months. From Garmisch-Partenkirchen it is a one hour drive to Neuschwanstein. Plan on leaving your hotel at least an hour and a half before opening time. Arriving early lets you purchase your tickets into the castle for the first tour of the day. It’s a quick tour and in less than an hour you will be free to explore the grounds around the castle. Don’t miss Mary’s Bridge. This is the spot to take those iconic photographs you always see of Neuschwanstein. Cross the bridge and head up the hiking trails for views down to the castle. You will leave most of the tourists behind and get stunning views over the valley that most people miss. This is also a great spot for a picnic! Note: The hiking trails are currently closed due to a rockfall. Visit the Neuschwanstein Castle website for more information. 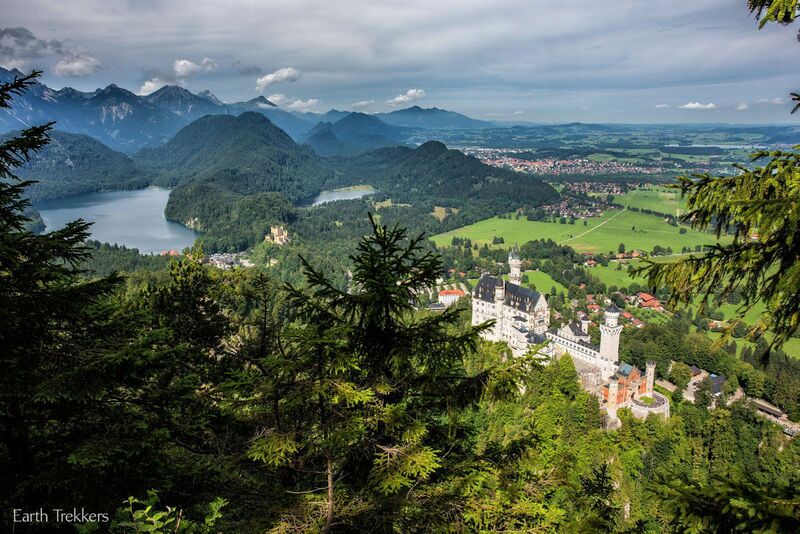 You have the option to also visit Hohenschwangau Castle, located just down the hill from Neuschwanstein. 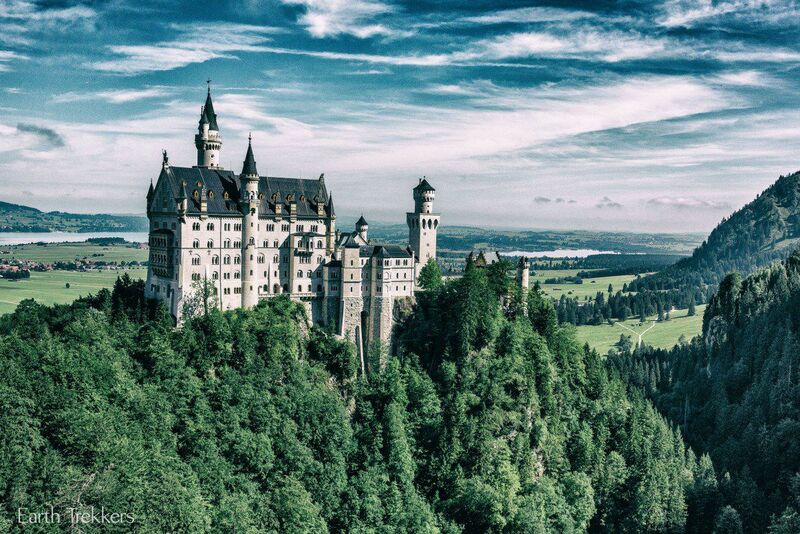 Not as showy or spectacular as Neuschwanstein, it may be worth it for those who love castles. You will have the rest of the afternoon free to relax or explore the other small towns in the area between Fussen and Garmisch-Partenkirchen. Austria is filled with small, photogenic cities and Innsbruck is no exception. Only 64 km (1.5 hours by car) this makes another great day trip from Garmisch-Partenkirchen. Innsbruck was the site of the 1964 and 1976 Winter Olympics. 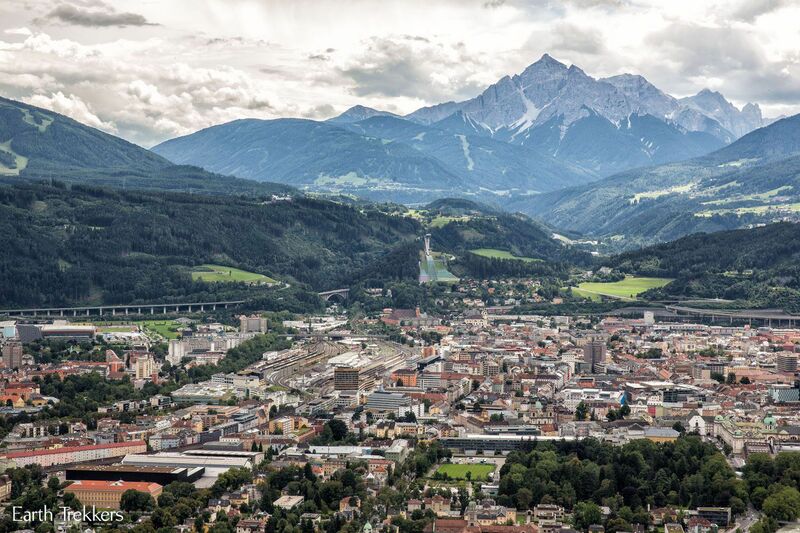 Things to do here include walking through the picturesque old town, ascending the funicular for views over Austria, climbing the tower in the town square, and visiting the Olympic village and ski jump. This is a huge driving day. If you hate the thought of sitting in your car for hours and hours, you may want to skip this day. 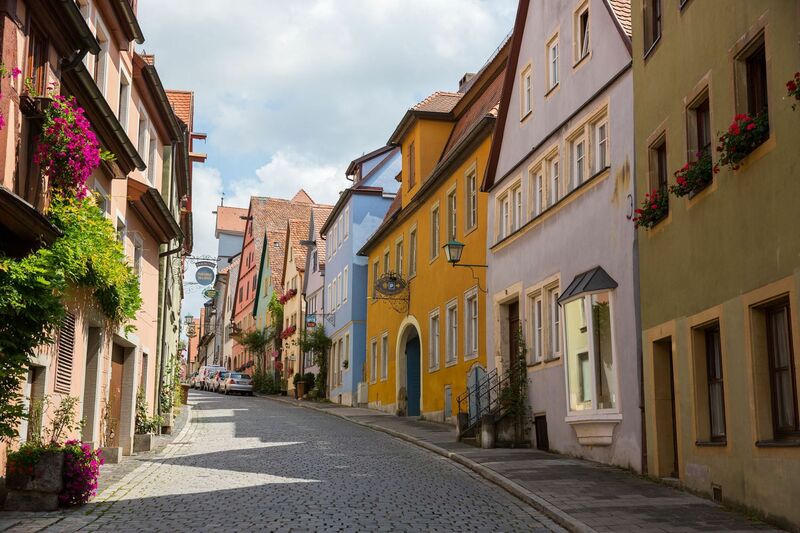 But, if you want to see one of the most picturesque towns in Germany, don’t miss this. It is worth the drive. 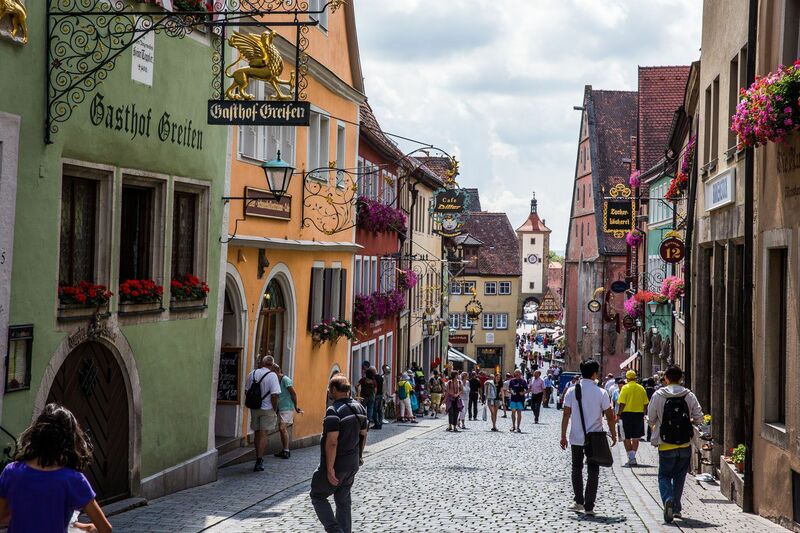 The Romantic Road takes visitors small town hopping as they head north from Garmisch-Partenkirchen to Wurzburg. In this itinerary, I only give one day for the Romantic Road, which forces you to skip the small towns in between. If you have time in your schedule, considering adding a day, visiting the towns along the way, sleeping at the halfway point. Our time was limited so we chose to skip right to the highlight of the Romantic Road. From Garmisch-Partenkirchen it is a 3 hour journey (330 km) by car directly to Rothenburg. If you leave early enough, you will arrive in Rothenburg in time for lunch and can spend the afternoon touring the town. 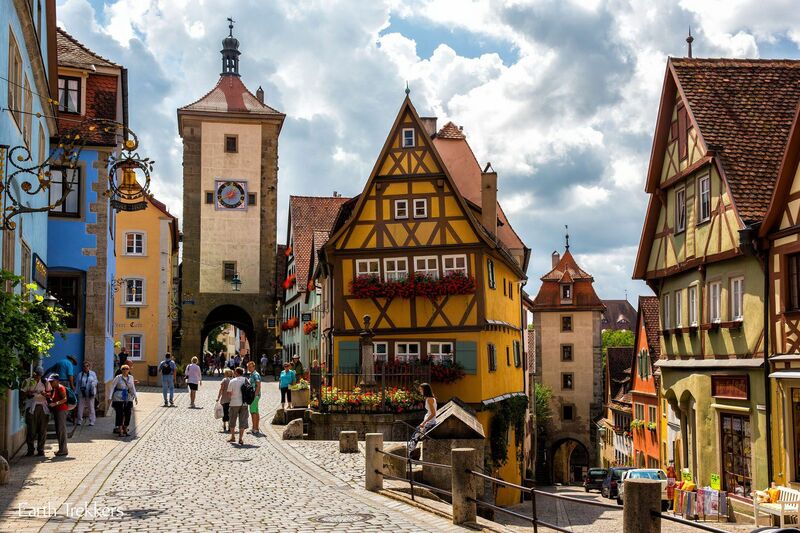 It only takes several hours to visit Rothenburg. The best things to do are wander the colorful streets, view the town from the top of the clock tower, go shopping, and dine on Schneeballen. Sleep in Rothenburg or drive to Munich (255km, 2 hours and 15 minutes by car). Once in Munich, drop off your rental car. There’s a lot to see and do in Munich and everything is connected by public transportation. 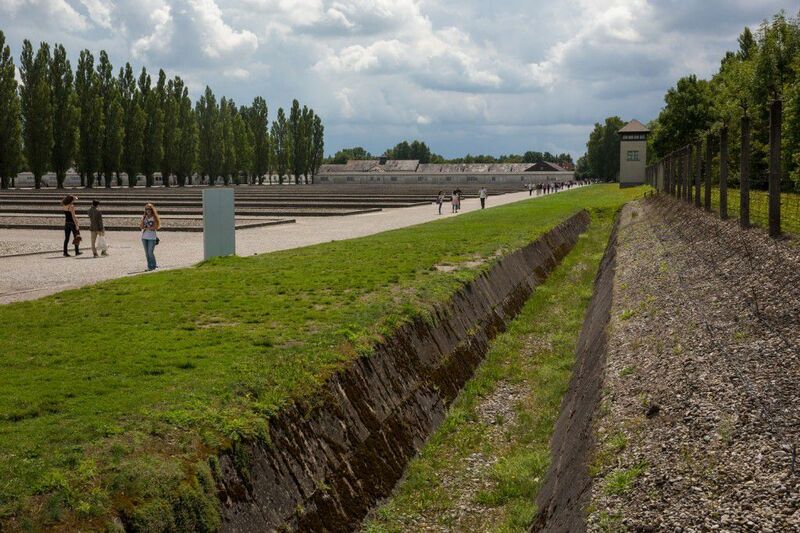 The top things to do are to visit Dachau Concentration Camp, stroll or bicycle through the Englisch Garden, have beer at one of the many beer halls (Hofbrauhaus is the most famous), see Marienplatz (the main town square), go to the BMW Museum and BMW Welt, and visit yet another olympic park. 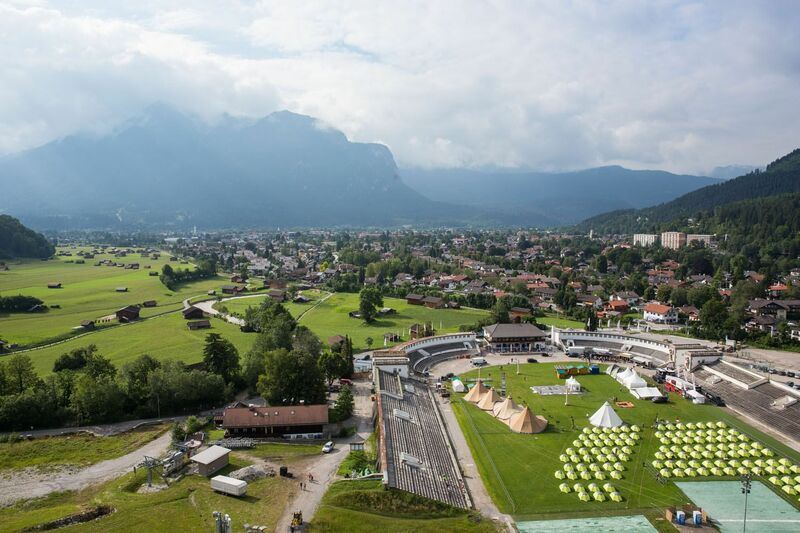 Liechtenstein can be visited in one day from Garmisch-Partenkirchen. It is 200 km by car or just under three hours of driving. Yes, it is a far distance to go, but when else will it be this easy to get to this tiny country? What is there to do in Liechtenstein? Honestly, not much. You can walk up to Vaduz Castle for views over Liechenstein, visit the town square, and visit the wine cellars of the Prince of Liechtenstein. Postage stamp collectors will love the National Museum. We visited Liechtenstein, and even though it was not the most thrilling destination, I am glad we got to see it. This itinerary does not allow for much time on the Romantic Road. Add on one to two days to take in all the sites, including Wurzburg. Bavaria’s second largest city. 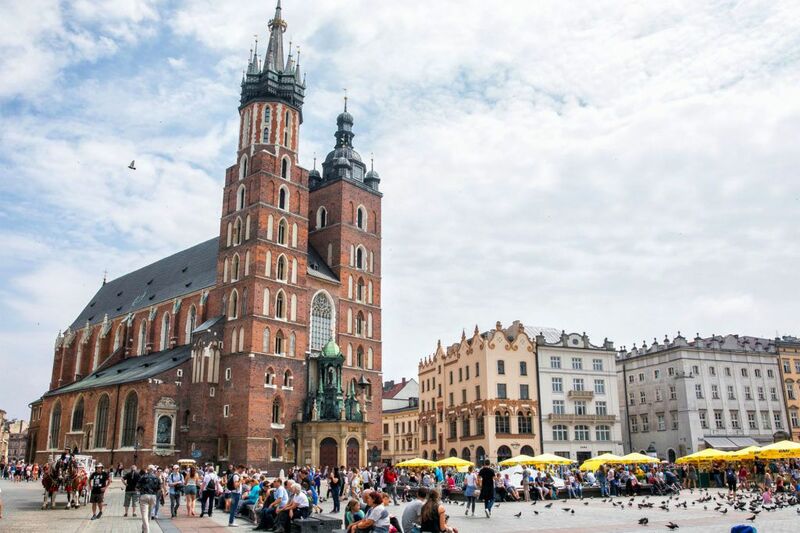 Spend a day or two here touring the city, drinking beer, and in the winter, shopping at its fabulous Christmas market. On day 3, spend the night in Salzburg, rather than returning to Berchtesgaden. The following morning, go to Hallstatt, and sleep in Hallstatt or Salzburg. The following morning drive to Garmisch-Partenkirchen. This adds one day to this itinerary. You can drive to Garmisch-Partenkirchen on the same day that you visit Hallstatt, but it will be a long day with a big drive at the end of it. Is this Itinerary Too Long? What do we recommend skipping? If you only have a week, you can still see most of what is on this list. On a good weather day, see Neuschwanstein in the morning and Zugspitze in the afternoon. We did it and loved it! See Salzburg, skip Innsbruck. 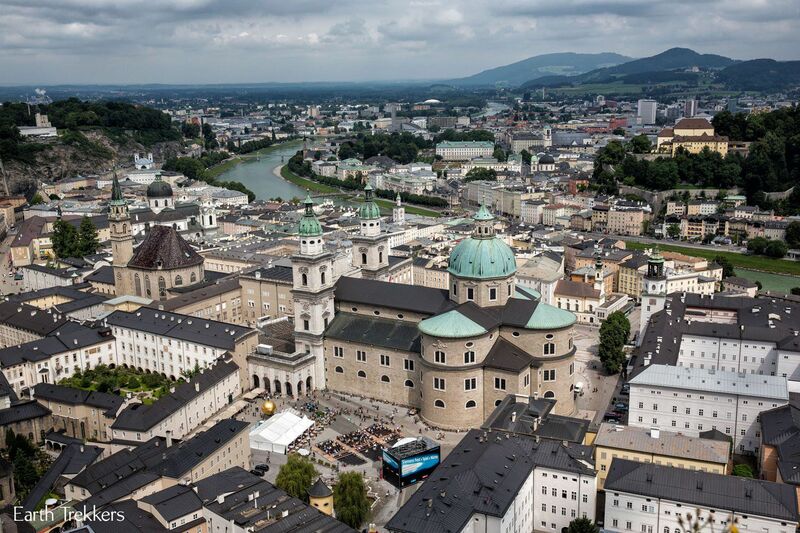 Yes, Innsbruck is beautiful, but Salzburg has more “must-see” sites. Spend only one day in Munich. Yes, that’s fast, but you could see Dachau in the morning, tour the heart of the city in the afternoon, and end your day at a beer hall. Any time of year. The summer is peak season. The temperatures are pleasant but expect rain (and crowds of people). While we were here in August it rained almost every day in the afternoon for a few hours. Winter is the time for Christmas markets, skiing, and being able to visit many places with a lot fewer tourists. Spring and fall are shoulder seasons. It would be beautiful to see Bavaria in bloom in May or on fire with autumn colors in the fall. Oktoberfest is a 16 day beer drinking party in Germany. It takes place in Munich, Germany. View the official website for Oktoberfest here. We recommend renting a car. The roads in Germany are fast, safe, and easy to drive. You can get to many places using public transportation but having a car makes life a lot easier. 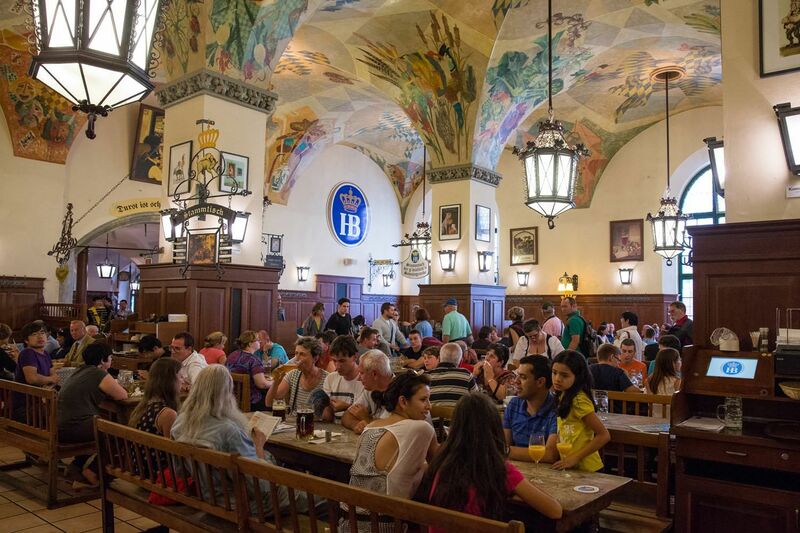 With this itinerary, pick up and drop off your car in Munich. 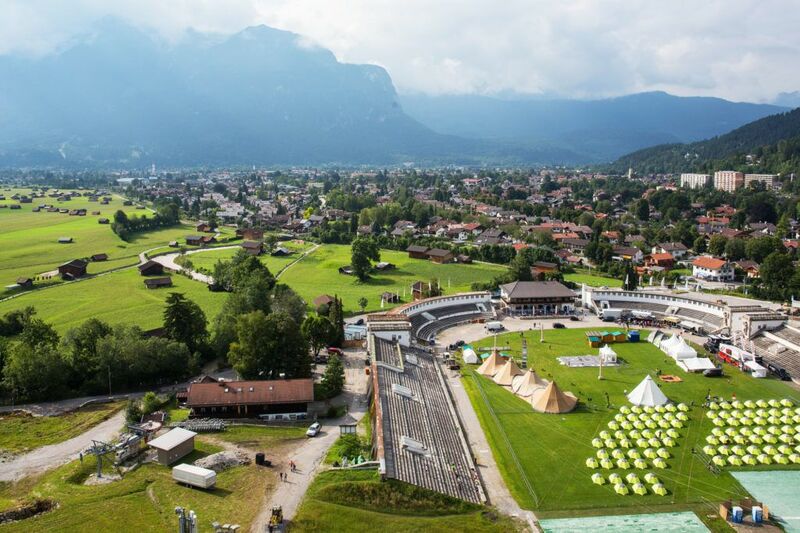 Your days in Garmisch-Partenkirchen can be rearranged. Plan on visiting Zugspitze on the day with the clearest weather forecast. Weather conditions change rapidly in Bavaria. If you wake up to crystal clear skies in the morning, they may not last long, especially during the summer months! 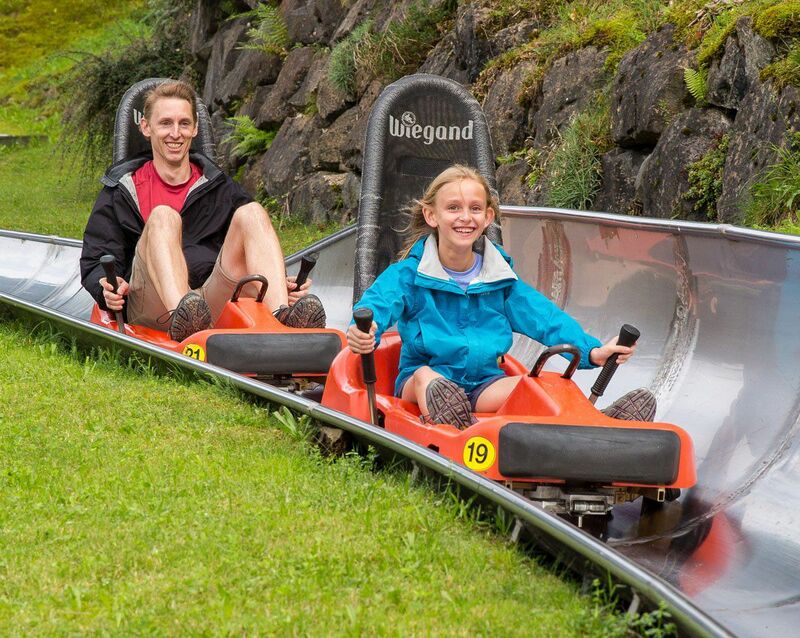 If you are traveling with kids, do not miss the toboggan (Sommerrodelbahn) in Garmisch-Partenkirchen. We went back several times and Tyler and Kara never got tired of it. You will need accommodations for three nights in Berchtesgaden, four nights in Garmisch-Partenkirchen, and three nights in Munich. Want to learn more about traveling in Germany? Check out our Germany Travel Guide. Love your itenaries. Planning a 9 day trip in July by more or less following your Bavaria Itenary, cutting our days in Munich short. Have 2 girls 5 and 8 so hoping to do the Sound of music tour. We are planning to rent a 9 seater as have 7 people travelling. Is it easy to drive around with a 9 seater?